It does become apparent your life maybe a little boring when you get excited about perfecting a recipe for bread. In my defence though, I think it is an accomplishment to create a loaf of gluten free bread that tastes as good as any 'normal' bread. I'll even go as far to say that it's better than some other bread. The main purpose of this challenge was to create a tasty loaf of gluten free bread without breaking the budget. If you have been reading this blog for a while, you may remember that six months ago I lost my job two weeks after I was diagnosed with coeliac disease. As you can imagine, I was quite pleased to see the end of February. I decided to pursue self-employment, which wasn't so compatible with the added cost of gluten free food. I started ordering food through the coeliac prescription service, which has saved money on things like flour and pasta. So I have based this recipe primarily on the products that are available to me to keep the costs down. These products are also available at most supermarkets, so don't panic if you can't get them via prescription! I have adapted it from a recipe in Gluten Free bread and cakes from your breadmaker which is a fantastic book if you're gluten intolerant and have a breadmaker. 1. Beat together the eggs and water, then pour into the breadmaker pan. 2. Add the oil, vinegar, milk powder and honey. 3. Add the flours, gum, sugar and salt, then sprinkle the yeast on top. 4. Set the machine to Basic, 700g/medium (my breadmaker doesn't have this setting, but it doesn't seem to matter), medium crust. 5. When cooked, switch off the machine, sprinkle the bread immediately with a little buckwhat flour (optional) and leave in the breadmaker for 10 minutes. 6. Turn the bread out of the pan onto a wire rack. When cool enough to handle, remove the paddle, if necessary. 7. 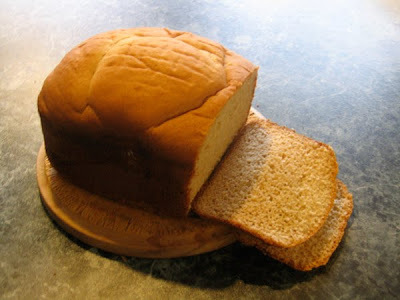 When cold, store in the bread bin for up to four days, or slice and freeze. Some notes: The buckwheat flour can be found at Binn Inn stores, and probably your local wholefood store. I get mine from Piko's. I have used a Breville breadmaker which doesn't have a gluten free setting. Use an active yeast, such as this Edmond's one. I have used Mauripan yeast, but I know some breadmakers don't like it, and I'm not sure where to get it from, I buy it from Nelson! Feel free to leave any comments if you try this recipe yourself, I'd love to know if anyone else likes it as much as I do. I'm sure it could be made without a breadmaker, I'm just not sure on things like rising time, oven temperature or baking time. If you do figure this out, please share below in the comments. Enjoy!